Read on and learn good stuff…. I’ve lived in Ames, Iowa for the past twelve years and am originally from Minneapolis, Minnesota. Ames is a relatively small community and I live close to campus where I teach. This affects my work because time that I might otherwise spend commuting can be spent in the studio. On the other hand, there aren’t many venues to attend art exhibitions so I’m forced to travel to major cities for that. I have a Bachelor of Fine Art degree from the Minneapolis College of Art and Design and a Master of Fine Art in Textile Design from the University of Kansas. My artwork explores the merging of historical with the contemporary, traditional with innovative, simple with complex, hand-made with digitally assisted. and third, the relationship between traditional hand techniques, which lend unique qualities to each individual piece of artwork, and digitally printed images, with which multiple editions and repeat patterns are designed and printed with ease. How does technology inform your practice and studio? Why do you think it is important to embrace new technologies? Several years ago, I received a grant from my university to purchase a Mimaki Tx2 wide-format ink jet printer to use in my classroom and in my own creative scholarship. Embracing new technologies can be expensive and time consuming to learn so I think each artist must decide for him or herself if the investment is worth it. As a college professor, it’s important for me to keep up with technology and, thankfully, my university supports that. In my most current work, embroidery isn’t used to illustrate a concept but rather embroidery is the concept. In previous work, however, I’ve used embroidery as another artist might use charcoal or bronze for its specific aesthetic qualities. What are you wanting to explore or state about domesticity through your work? Some of your imagery/drawings almost seem to reference graffiti, can you discuss this? These two questions are interwoven in my artwork. I think both traditional domestic arts and contemporary graffiti are underappreciated. But beyond that, I see a unique correlation between the artists themselves. The image of the urban graffiti artist may seem in stark contrast to the refined young woman who embroiders linens and samplers, but the more I work with these kinds of images, I realize how much they really have in common. For one thing, there is a certain amount of anonymity among both graffiti artists and the creators of historical embroideries that I draw from in my artwork. Both are generally 8-18 years old, and they learn through teachers or mentors rather than family members. Graffiti artists are often marginalized members of society and their artwork helps to give them a voice and allows them to be visible members of society. And, the young women who created historical schoolgirl samplers were also marginalized within their communities–they would grow up to become the property of their husbands (and if they didn’t marry, they remained the property of their fathers); as women, they couldn’t own property and they weren’t allowed to vote. Samplers undoubtedly gave these girls some sense of ownership–what was created served as an historical record of the their lives. The same is true for graffiti and those who create it. To create my artwork, I manipulate my own photographs using off-the-shelf digital imaging software. Compositions are printed onto cotton canvas using a wide-format ink jet printer followed by hand-printing and/or hand-stitching. Honestly, I struggle with getting older. When I was younger, I took my body and its abilities for granted and did things I probably shouldn’t have. Certainly the use of technology has changed the way in which I work. At times, my entire studio is contained within my laptop and the digital printing process has shortened the time it takes to produce a printed textile. The digital process allows me to create more complex imagery and I can print larger images with relative ease. At the same time, I’ve increased the amount of embroidery in each piece, which slows down the process considerably. Twice during the past year, I traveled to China and recently received a grant to develop new artwork that explores the relationship between historical styles and contemporary forms of visual expression reflected in Chinese textiles, ceramics, architecture, and other forms of visual and material culture. How does being a professor affect your practice as an artist? It would be more difficult for me to be an artist if not for the somewhat flexible schedule my teaching job allows. I have a great deal of respect for those who can manage a successful studio practice while working “nine-to-five” for someone else. As a professor, I’m also more inclined to learn new things in order to share them with my students. They also share with me things they hear about or see through various media outlets that I may otherwise miss. Teaching others requires one to be a life-long learner. I have several upcoming exhibitions. In September, I’ll have artwork in a two-person exhibition with Jodi Colella at the Textile Center in Minneapolis and will also participate in a faculty exhibition at the Brunnier Museum on the Iowa State University campus. In October, I’ll be participating in “Contemporary Textile Art from the Masters,” which is part of a textile symposium in Antalya, Turkey and next February I have a solo exhibition at the New Harmony Gallery in Indiana. My web site is www.teresapaschke.com. Thanks so much to Teresa!!! DO YOU have an artist you want interviewed? If so please leave suggestions in the comments. and don’t forget to submit your work to my current curatorial call. Get the details here. Wow! So thrilled to see Teresa profiled here. 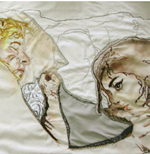 Her work is in an exhibition here at the Textile Center in Minneapolis and the opening reception is tonight (9/7)! We can’t wait to see how everyone reacts to the pieces in person, because they are amazing! thanks for doing these interviews, its very informative! Wish you could interview Lauren DiCioccio…would really like to know more about her…. I love Lauren’s work too and she would be a great person. I am feeling I once contacted her a long time ago but should try again. Thanks for the suggestion.